We all appreciate our independence. After all, we work our entire lives to support ourselves and develop a routine that brings us happiness. It’s no surprise that 90 percent of seniors prefer to age in place and maintain their independence for as long as possible. 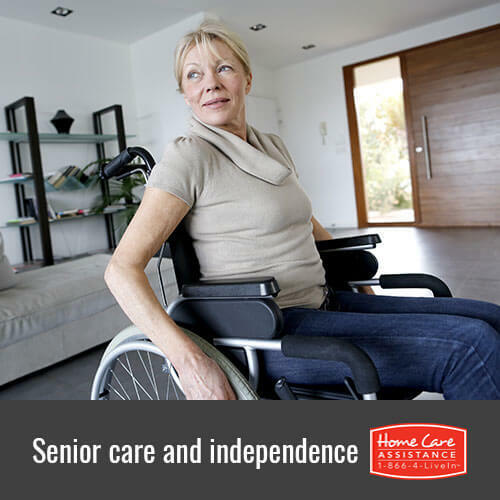 Utilizing a Toronto home care agency is one way for seniors to remain in their home rather than moving into a facility and it can promote independence in several ways. Many seniors struggle with isolation for any number of reasons, although seniors with Alzheimer’s are at a greater risk of loneliness. In fact, social withdrawal is one of the first symptoms of the disease. Home care providers in Toronto can offer seniors companionship and conversation in their home and help them engage in activities to promote health. In fact, socializing has been found to slow cognitive decline. Many seniors with Alzheimer’s find themselves housebound because they can no longer drive safely or use public transportation alone. Caregivers in Toronto can fill this important need by providing transportation and helping seniors stay involved in the community, go shopping, or visit the doctor. Caregivers can help on a part-time or live-in basis to assist a senior with daily activities on his or her own schedule. Services provided may include meal preparation, transportation, or mobility assistance. Sticking to a familiar routine in a comfortable setting may help seniors with memory loss feel more secure during the early stages of the disease. Home caregivers work to include seniors in the planning process so they can have control over the help they receive. Seniors have the opportunity to discuss what they do or do not like and the type of care they prefer to receive. This can be especially important in the early stages of the disease when seniors with Alzheimer’s may feel like they’re losing control of their life. Alzheimer’s caregivers can help also help seniors with light housekeeping that may be difficult to manage on their own. Many seniors with memory impairment struggle to perform basic tasks like vacuuming and cleaning dishes. Without assistance, these seniors may end up living in unsafe or unsanitary conditions. Learn more about promoting a high quality of life for a senior loved one from Home Care Assistance. We are a trusted provider of Alzheimer’s and dementia care in Toronto and include the use of our revolutionary Cognitive Therapeutics Method in all care services. CTM is an activities-based program that helps seniors stave off memory loss and boost mental acuity. Don’t hesitate to reach out to us today at (416) 488-8777 and request a free in-home consultation.